Published Sep 20, 2018 By Julia 45 CommentsThis post may contain affiliate links. 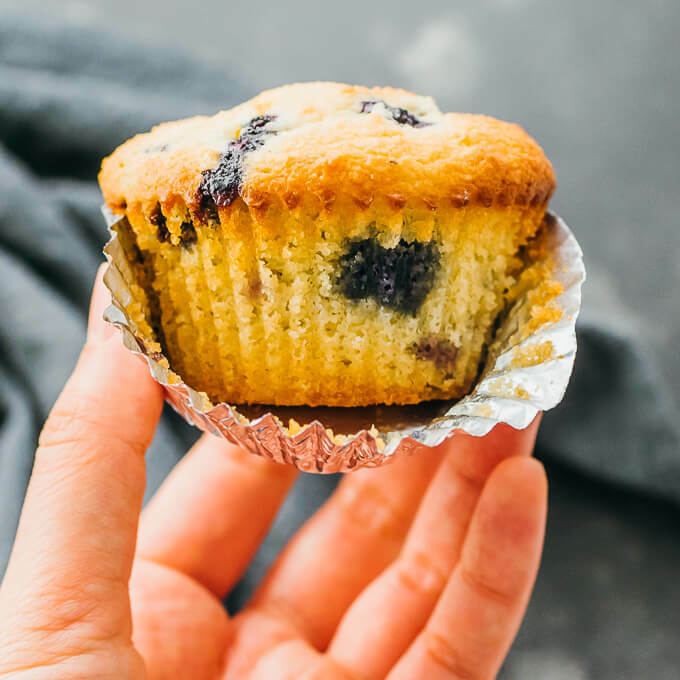 An easy low carb and keto recipe for blueberry muffins made with almond flour. 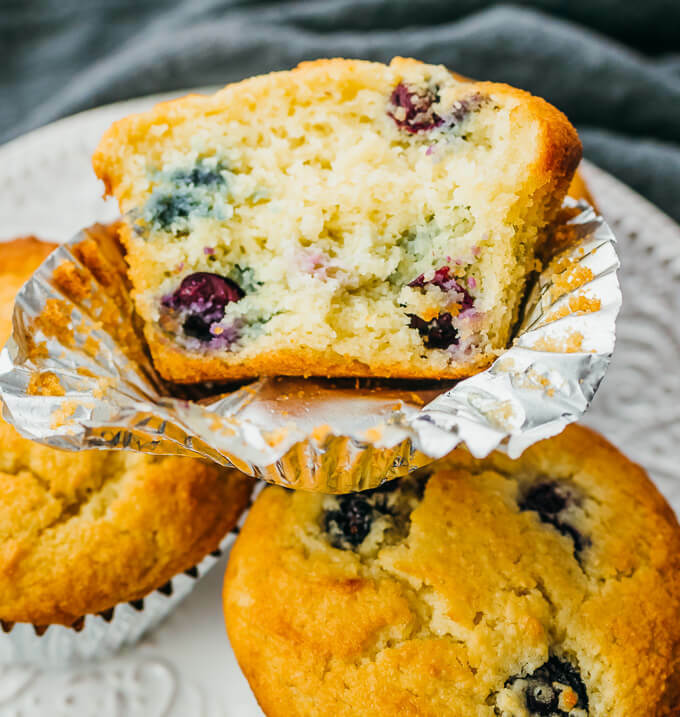 These blueberry muffins are soft and fluffy, great for breakfast or as a convenient snack. 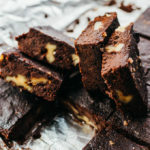 They’re only 3.5g net carbs apiece and will help satisfy your sweet tooth cravings. They’re pretty straightforward to make, with all of the ingredients mixed in a single bowl. The batter is transferred to greased muffin tin liners, and they’re baked in the oven until golden on top. 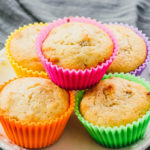 These muffins are made with heavy cream; for sour cream muffins, check out these low carb banana bread muffins. 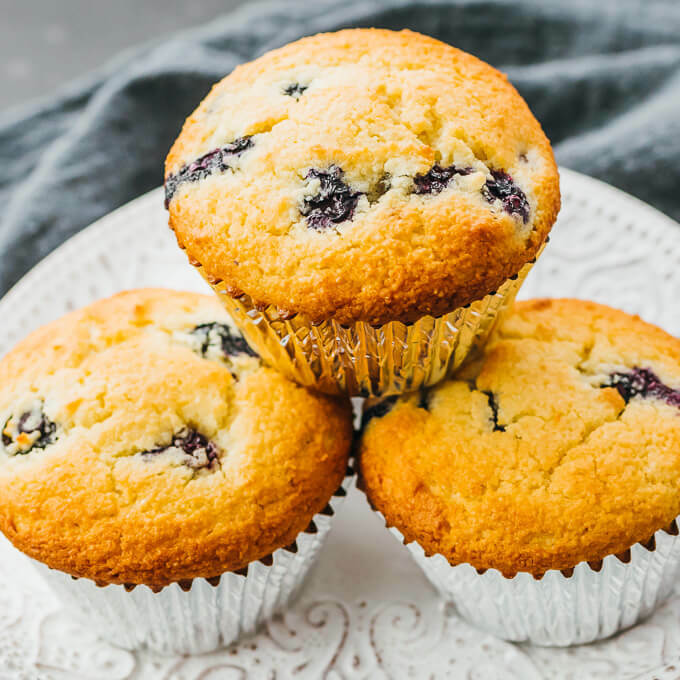 The batter should be thick enough so that the blueberries don’t sink to the bottom of the muffins. But it shouldn’t be too thick such that you have a hard time scooping it up and filling the muffin liners. When stirring and lifting up the batter using a mixing spoon or spatula, the batter should have no problem sliding and falling off. If it’s too thick, add a tablespoon of heavy cream at a time. 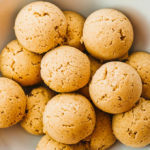 If too thin, add just enough almond flour until it has the right consistency. My oven usually takes about 25 minutes to bake the muffins until golden brown. Depending on your oven, it could take a longer or shorter amount of time. I recommend monitoring the muffins frequently to avoid overcooking. If it’s your first time making them, you may want to start checking them for doneness using a toothpick starting at 20 minutes. 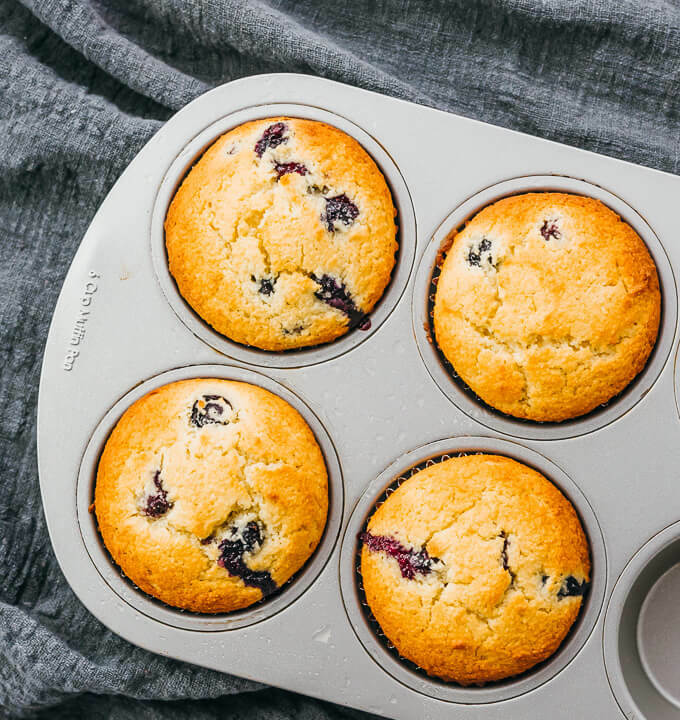 Muffin Tin: You’ll need a standard muffin tin that can hold at least 4 muffins. Muffin Liners: I use foil liners, which makes it easy to lift the muffins from the tin. Nonstick Cooking Spray: I grease the liners using nonstick cooking spray so that the muffins can be easily released. Kitchen Scale: For best results, I recommend measuring out the main ingredients by weight and not volume. 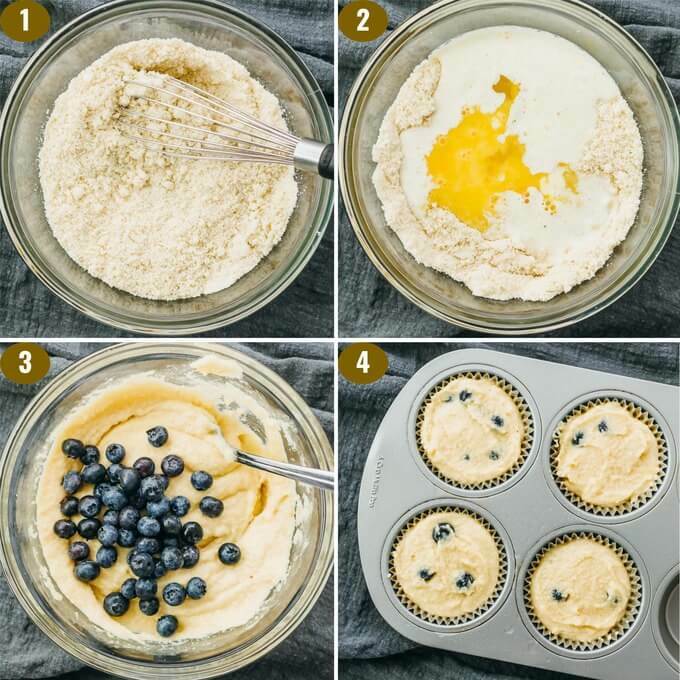 When selecting blueberries, pick the smaller ones to use in these muffins so that they’re more evenly distributed in the batter. That way, you’ll get more frequent bites with blueberries in them. Save the larger ones for snacking! I use a natural sugar-free sweetener called swerve, which is an erythritol blend that measures the same as sugar. Any other dry sweetener will also work well; for best results, make the appropriate sweetener conversions by weight so that you end up with the correct amount of sweetness. 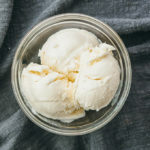 Note that pure erythritol is only about 70% as sweet as sugar, and often comes in rather large granules that should be powdered using a Nutribullet or similar blender before using. You can serve these muffins as soon as they’re cool enough to handle. For leftovers, cover and store them at room temperature. Position a rack in the center of the oven. Preheat to 350 F. Prepare a muffin tin fitted with 4 liners. Grease with nonstick cooking spray. In a bowl, add dry ingredients (almond flour, sweetener, baking powder, salt). Whisk until well-mixed. Add heavy cream and beaten egg to the bowl. Stir together until well-mixed. The batter should be thick, but should fall off a mixing spoon when lifted up. If too thick, add another tablespoon of heavy cream. Gently fold in blueberries until well-distributed in the batter. Divide the batter among 4 muffin liners, filling each all the way to the top. Smooth the top with a spatula. Bake at 350 F until the tops are golden, about 25 minutes. A toothpick inserted in the center should come out clean or with a few dry crumbs. Let them cool a bit before serving. This recipe yields 3.5 g net carbs per serving (1 muffin or 1/4 of the recipe). Nice and fluffy, used frozen blueberries. Not too sweet, delicious! See previous comment by Cat, who described her experience using frozen blueberries. Theses are the best keto low carb muffin I have ever ate. Only problem is I made the four yesterday and now they are all gone. I forgot to add to my comment below…. I just made these. After reading the comments, I went ahead and added the tsp of vanilla, lemon zest and measured everything out on a scale. THESE WERE SOOOOO GOOD!!!!! Anyone know about how long will these stay good if I put them in a ziploc bag and put in my pantry? Can you sub another berry and any suggested adjustment?